We arrive in Brest and our new sat nav takes us straight to the hospital, we find a parking space. The main road outside the hospital has parking spaces all along with no charge. We love Brittany so much! So we head over to where I think it is with john convinced we should go in the opposite direction, there are so many entrances. We see somebody and ask for directions to the dentist and he replies in English, I think at some point I will stop sounding like a sat nav, even with all my words correct people know immediately I am not French. But hey he was helpful. We head back over to building 5 and enter there is a great big sign stating what is in there and there is nothing to do with teeth! But then we see the accueil sign and a number of desks, we go over to one to ask what we need to do and this is it, this is where we book in, this is where everybody books in for which ever department or building you require. Why they don’t have this info on the front door, we have no idea, but at least we got to visit most of the hospital. We have our documents and ID checked and are given some papers and told to go back to building 6 (the dentist). The emergency dentist in Brest is open from 9, 30 to 11.30 and 1pm to 4.30 so we are now definitely not the first in the queue. But it does not take long to be seen, the staff were excellent, and the male dentist could speak English, though unfortunately he wanted me to stay in case of any problems. I don’t think I gave John much comfort as I sat there shaking and feeling ill. 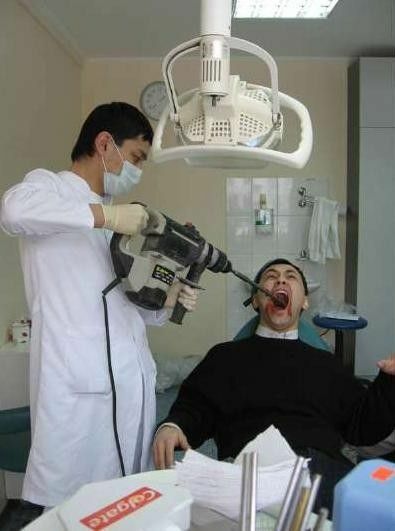 I am not good with the dentist! But he was x-rayed and there was a large infection, the dentist drained and cleaned it and then prescribed some even stronger anti biotics and a mouth wash and told us to make an appointment to see a dentist, at this point we all laughed a little bit, he said if there were any problems to come straight back until the dentists returned from their summer holidays. We leave and once again think how fantastic the health care is in France and how lucky we are to live here. Ensure you have full ID with you. If you are going to an open appointment (1.30 – 4) go a little earlier to register so you are not too far down the queue.